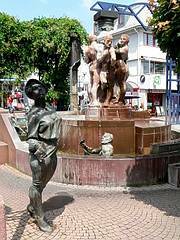 The charming and distinctive appeal of Bad Wildungen is owed to the astonishing variety of places to discover. In the centre of the timber-framed old part of the town stands the gothic church with the famous winged altar by Conrad von Soest (1403). Within easy reach is the baroque Castle Friedrichstein, Europe´s biggest Kurpark (spa-gardens) and the bustling promenade Brunnenallee framed by fine buildings in Art Nouveau and Wilhelminian architecture, and numerous fountains. The town has five museums which are well worth a visit. In the middle of the traditional Kurpark is the newly renovated Wandelhalle, the historical pump room as the place where visitors can drink different types of spring water. In 1929 the building was erected in Hellenistic style and holds also a museum which tells the history of the town as a spa-resort. Since several years, there are a variety of themed tours through town, e. g. a guided tour with the historical nightwatch man. Visit Snow White’s presumed dwarven home in Bergfreiheit (Bad Wildungen is a member of the German Fairy-tale Route) or experience historical craft and farming in the Odershausen Living Museum. The town and the rural surroundings cover an area of more than 120 sq km of unspoilt beech forests with more than 500 km of hiking trails. Two of these are internationally renowned. 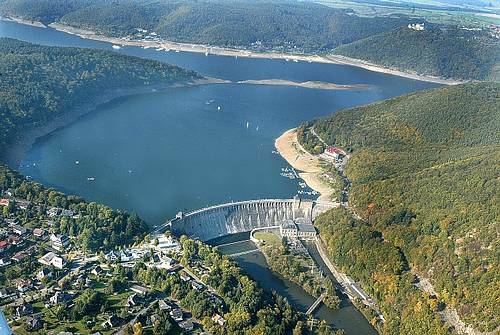 Visitors are also invited to explore the outstanding beauty of the nearby National Park Kellerwald-Edersee. The town flourished in the 13th and 14th centuries. 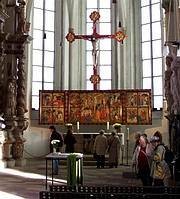 It was also during this time that the town wall and the large, late-Gothic church were constructed. The latter is surrounded by the many half-timbered houses and preserved fortifications of the quaint Old Town. Visitors may be interested to know that the church houses Conrad von Soest’s (Northern Renaissance painter) famous winged altar, which dates back to 1403. The neighbouring, Schloss Friedrichstein is a former seat of the princedom of Waldeck and now houses the Hunting and Military Museum which is part of the Kassel museum complex. The three-winged, baroque castle was constructed in the early 18th century on the site of an earlier castle and boasts original ceiling murals and stuccowork. The ancient “Niederwildungen” experienced a strong upswing at the end of the 19th century. Famous guests from throughout Europe gave the spa town the flair of a world-famous Spa. The town expanded along the Brunnenallee. Imposing spa hotels, cafés, guest houses and Art Nouveau houses ("Fürstenhof") were built. Magnificent villas in the Hufelandstraße built at the end of the 19th century bear witness to this mundane past. In 1906 Niederwildungen received the title “Bad” [Spa] and became Hessian State Spa after the second World War. The town’s Quellen (Spa) Museum is particularly interesting and serves as an exhibitory museum for the whole of Hessen. It is located in the extensively renovated pump room and is an attractive, realistic showcase of the development of spa culture in the region, from its very beginnings to its modern day status. The Odershausen district is proud of its ‘living museum’ where visitors are invited to travel back through time and experience village life as it once was. The history of the town comes alive in several town museums. The Stadtmuseum [Local History Museum] in the old town shows the early and town history. The Jagd- und Militärmuseum der Staatlichen Museen Kassel [Museum of Hunting and Military of the State Art Collections Kassel] is located at the impressive baroque castle “Schloss Friedrichstein”. The Kurhaus is at the core of the town’s cultural sphere. Its elegant atmosphere and close proximity to modern and luxury hotels make it ideal for conventions and congresses. Attention from the German press triggered the inauguration of the ‘Kurschatten’ monument. An imposing landscape of springs between the Old Town and spa district testifies to the history of Bad Wildungen’s spa culture and is a source of inspiration to many. The refurbished copper mine in the Snow-White Village of Bergfreiheit and the nearby Eder Lake are further places of interest. We would like to welcome you to the new "Discovery Region Edersee" website. Here, in Hessen's verdant north, ten cities and towns around the tourist magnet Edersee and in the middle of the unspoilt Kellerwald, have joined forces to provide you and your loved ones with an unforgettable holiday experience.